Among the world’s major religions, Hinduism probably wins for doctrinal tolerance. Not that this necessarily counts for much, since doctrine and practice are two very different things. There’s nothing stopping even broadly-regarded-as-mild-mannered religions from having violent zealots, as evidenced by the rising threat in recent years of … Buddhist fundamentalism (yes, Buddhist fundamentalism). Think your eternal soul is the same as the spirit of the universe? Or maybe it’s different? Perhaps it’s of the same essence, but not identical (the “you are to God as your dandruff is, to you” worldview)? Or maybe you don’t even have an eternal soul? Well, Hinduism’s underlying unity is strong enough to encompass these and more, as religiously acceptable metaphysical positions. There are some comical side-effects from this diversity, too. We have letters from early Christian missionairies to India complaining that, the more they told the locals that Jesus had descended from Heaven and taken on a human form to save mankind, performing miracles as signs of his divine power, the more convinced the Indians got, that He was God – specificaly, the long-awaited tenth incarnation of Vishnu, descended from Heaven in human form to upend evil and restore religious righteousness. And the stronger their faith in Hinduism became! Unfortunately, Hinduism is old enough that we won’t ever know what enlightened pluralists first invoked the notion in the Rig Veda (which probably dates to 1400 BC, give or take a few centuries) that “the truth is one, though the sages speak of it by many names”. Which leaves us with Christianity, which most definitely is a “unity in diversity” story. From two thousand years on, it’s easy to think of it as monolithic – by and large, adherents use the same text and agree on the same core doctrines, even if their interpretations vary wildly. It wasn’t until German scholars in the 1800’s applied the techniques of literary analysis to the Christian scriptures, that anyone realized how far apart those early writers were. They weren’t squabbling teammates; they were on opposite sides of seething disagreements, with each faction trying to exterminate the others. The form-critical method these academics pioneered would go on to revolutionize Biblical studies, undermining church tradition so completely that it gave rise to the saying popular in academic circles, that “those who take the Bible seriously, don’t take it literally; and those who take it literally, don’t take it seriously”. Sadly, some congregations turn away from the new insights of scholarship, maybe worried that the experiential reality of their religious experience is somehow dependent on the factual accuracy of their texts. And so their study classes – accredited by no institution except the group leadership (bit of a warning signal there) – are less about discovering truth, than defending tradition. While it can take a long, long time for scholarly opinion to change in the social sciences, I hope that by the time I’m so old I prattle on verbosely on obscure topics, oblivious to my audience’s acute disinterest :) a solid minority of academics will have come around to the hypothesis that Polycarp of Smyrna (approx. 70–160 AD) was the seamster who pulled the feuding Christian factions together. The basic theory is explained in this article by Biblical scholar David Trobisch, which is a continuation of his postdoctoral thesis. The thesis argued that since virtually all early canonical (that is, non-heretical) Christian writings that have survived, use shorthand contractions for specific words, they were likely copied from an abbreviation-friendly scribe’s master copy. The article suggests that it was Polycarp; the evidence is circumstantial, of course, but there’s a lot of it. And while it wouldn’t be good enough for a criminal conviction (“beyond a reasonable doubt”), I think it would meet the standard for civil law (“balance of probabilities”). As it turns out, Polycarp was a prominent follower of John of Gospel of John fame, had been chosen as his community’s representative at a summit with the Pope, and lived at the same time as one bishop Theophilus of Antioch. 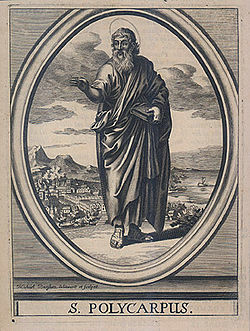 And not only are the prefaces to the Gospel of Luke and Book of Acts addressed to one Theophilus, but at the end of John, the narrator addresses the readers directly and basically reassures them that what he wrote was the testimony of the “beloved disciple” (John) himself – testimony that Polycarp would’ve been in a position to have claimed to have directly received. It’s also universally accepted that the first person to create a collection of Christian writings was Marcion, around the year 140. Since the orthodox church considered him a heretic and an existential threat – in some parts of the Roman Empire, Marcionites became the dominant Christian group – it would make sense that it would create its own authoritative collection of texts, in short order. (Indeed, the New Testament contains the entire Marcionite canon – ten letters of Paul, plus the Gospel of Marcion, a “corrected” version of which we call the Gospel of Luke.) And once again, Polycarp is attested as having been an orthodox contemporary and opponent of Marcion’s. The most tantalizing hint comes from one of the Pastoral Epistles (2 Timothy), traditionally attributed to Paul, but long recognized as coming from the 2nd century – when Polycarp lived. The Pastorals discuss issues that Paul couldn’t’ve encountered in the 1st century, so are judged to be forgeries for the same reasons that, oh, letters of Abraham Lincoln discussing the internet would be recognized as fakes. 2 Timothy references a variety of early Christian figures known from elsewhere in the New Testament, and two who aren’t: one Carpus (perhaps he hadn’t yet earned his “Poly-” prefix?) and Crescens, who is known from Polycarp’s introduction to the Letters of Ignatius… as Polycarp’s own secretary.